I confess: I have been away on a long road trip with four hunks, eating plenty of gourmet food and had plenty of wild adventures. 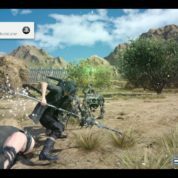 Yes, I have been immersed for a long time in the world of Final Fantasy XV (FFXV) where there is so much to explore and do that I was reluctant to step out. 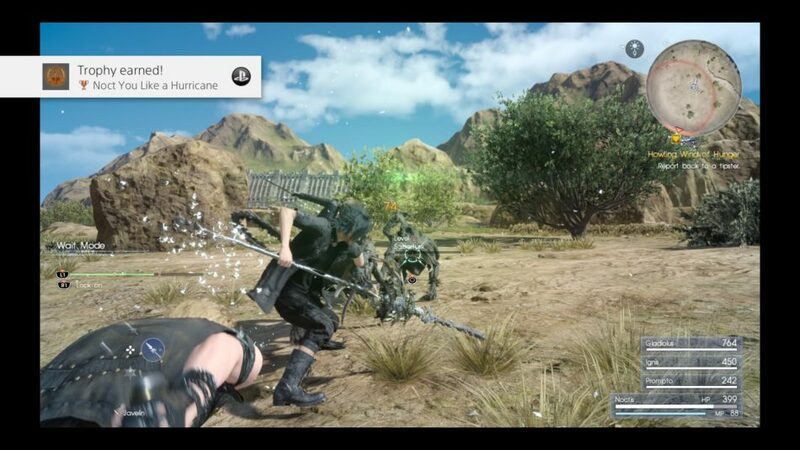 A game 10 years in the making and touted as an FF game for first timers and veterans, FFXV was a breath of fresh air in the long running series. From the early FF games on the Nintendo NES system to the very first Sony PlayStation, FF games have been highly regarded for their strong stories, memorable characters and soundtracks that tug at your heartstrings long after you finish playing the game. Not all FF titles are equally great but FFXV gave me the tingle that I used to get from FF games. 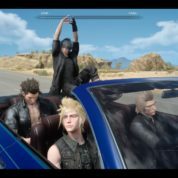 FFXV is designed as an open world game where your party drives or rides Chocobo to explore a huge map – very much like going on a road trip with your mates. 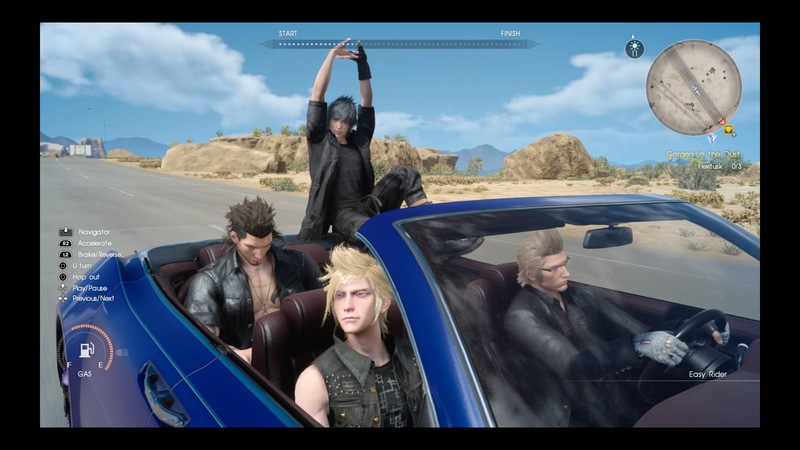 You can either drive the car manually as Noctis, the main playable character, or have Ignis, the default driver of the party, autodrive to your destination while you enjoy the ride or go grab a drink and make a snack in real time. That said, FFXV is not a truly open world driving game as you are restricted to driving on roads while Chocobos give you a bit more flexibility to explore the terrain, although dungeons need to be explored on foot. The boys also refuse to go into water, so there are no opportunities for underwater exploration. While FFXIV was an MMORPG, FFXV is played offline and has main story missions and a whole slew of mostly glamourised “fetch” side quests. These can be assigned by the many NPCs as well as your own party members, such as retrieving items, collecting specimens, hunting strange and exotic beasts in the wild, and even taking photographs. Minigames like the element-based pinball game “Justice Monsters Five” is surprisingly fun and addictive, which further distracts you from the main story missions. Even the main quests offer a good variety, including major battles, sneaky infiltration missions, or light hearted ones where you choose the best answers for Noctis in a dialogue with a lady companion, reminiscent of Japanese dating sims. Occasionally, you join forces with other allies to complete missions, which helps in adding some variety to the gameplay. 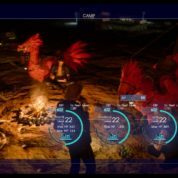 What is great about FFXV are the frequent updates – one notable example is the constantly updated random dialogues between the party members so you don’t hear the same repetitive comments all the time. Also, more recently, the developers have added limited timed events and contests which reward you for encounters with specific creatures during a certain time. For February and March, it’s a Cactuar and Slactaur hunt, which keeps the game fresh and gamers coming back. FFXV is a real treat for the eyes. The scenery is magnificent, with the unearthly wild landscape created by a fallen comet, settlements that are inspired by the trucker rest stops in the United States complete with diners, motels / trailers and gas stations, as well as beautiful large European-styled cities that are a thrill to explore. 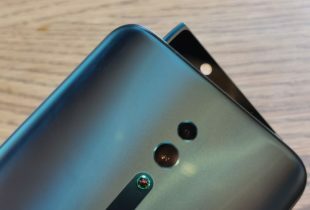 Characters are beautifully rendered in such fine detail that you can see wrinkles, moles and veins. When it rains, you can see that the clothes of the party are slick with moisture and the landscape is drenched. 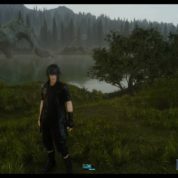 The day and night cycles add another dimension to the game where you have certain hunting and fishing activities you can do at different times of the day to yield different quarry, and also certain dungeons that are only accessible at night. There are occasionally some bugs where night time hunts do not trigger, forcing you to restart the quest. The night is also dark and full of terrors, with high-level Daemons that can attack your party, so low-level parties should only travel during the day. 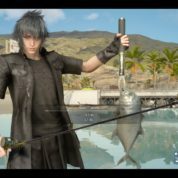 FFXV upholds the tradition of the series with a magnificent and highly detailed bestiary that seemed to be designed by a Creator who adds a crazy twist to the animals – one example is the amazing Catoblepas that has a body of an ungulate, long spiky neck and a pig-like snout with tusks and hangs around a body of water like the Loch Ness monster. Or the magnificent Coeurl that looks like a leopard with whip-like whiskers. There are also majestic gigantic birds like the Griffon that you can see soaring in the sky which takes your breath away. Speaking of birds, what is an FF game without Chocobos? These huge birds are really useful even though they cannot fly – not only are they a great alternative form of transport across the wilderness where automobiles cannot traverse, they can aid you in battle, whisk you away from a fight and even perform a dance to boost your stats. Not to mention they are super cute and you can customise their names, colours and medals, and use them to take part in Chocobo races. 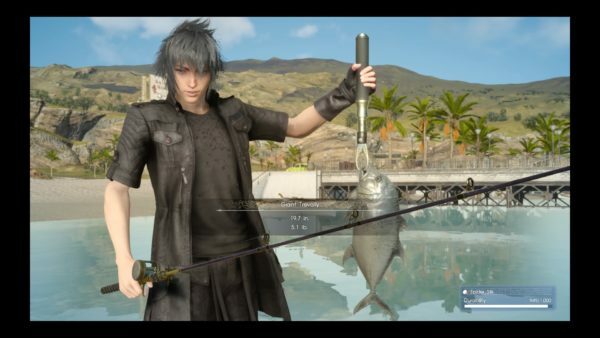 Don’t play FFXV if you are hungry – the highlight of the game is the food which are rendered in such loving detail that no foodie is disappointed. 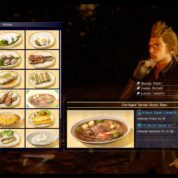 As you explore more, Ignis will get new recipes – these can be obtained through buying cookbooks, trying new cuisine at restaurants and even acquiring a new ingredient through fishing, hunting or shopping. 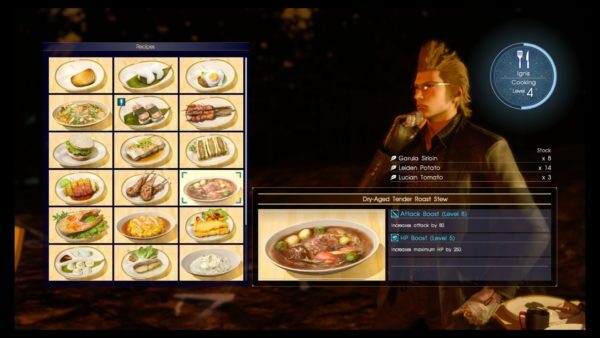 While the party is camping, you can select what gourmet dish you want Ignis to prepare. Singaporean gamers will be happy to note that the Peppery Daggerquill Rice that strongly resembles our Hainanese chicken rice. Different dishes offer different types of boosts for the next day, which is great if you are planning to explore a dungeon or expect to encounter many enemies. If you are willing to spend a bit more and forgo boosts for more XP gain, you can also check into accommodations in town, so it forces you to plan your daily itinerary so that you can maximise on your XP gain or boosts. Having all guys in the party makes the game feel like a long “all-bro” roadtrip – the women encountered during the trip all have secondary, non-player roles. I felt that it would have been nice to have some ladies to balance out the gender ratio and also possibly more opportunity for variety in dialogue. I find it amiss especially for the FF series which traditionally has such strong and memorable female characters. Although there’s a bit too much testosterone in the game with an all-guy party, it helps that the characters are diverse, with opportunities for deeper conversations between Noctis and his party members. Noctis himself is an angler and he can fish at certain fishing spots through a fishing minigame for potential dinner or a trophy fish for bragging rights. Although it is a little odd that war is raging and kingdoms are at stake, yet the boys spend time on leisurely pursuits such as taking inane selfies/wefies, fishing, Chocobo racing, playing pinball or hunting. FFXV’s combat is also markedly different from the usual FF type games – in FFXV, combat is in real time. 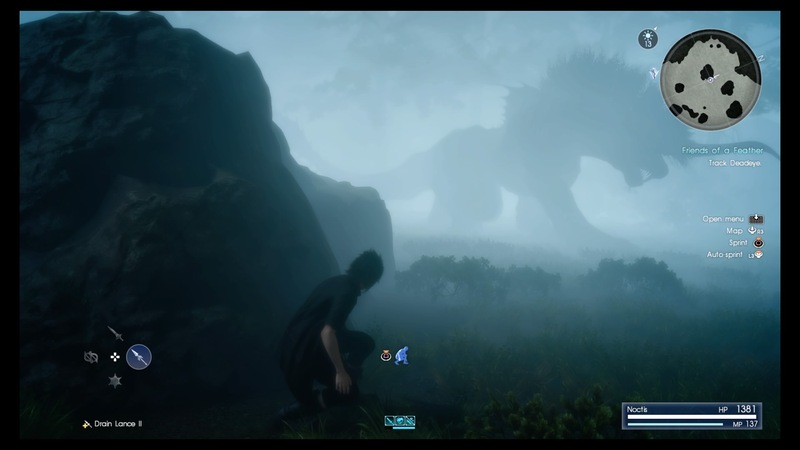 While you can pause for Noctis to give commands to the other 3 party members, you can only control Noctis in battle. He can perform regular attacks with a choice of weapons, or warp to a higher perch, or towards an enemy for warp attacks, or special attacks by chaining attacks with his buddies or a “uniquely Noctis” powerful Amiger combination attack. 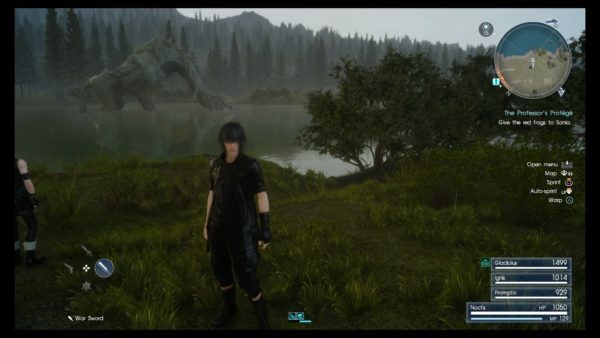 Noctis can also summon Archaeans at times when the conditions are met and at certain regions, so don’t count on it as the main weapon in your arsenal. On top of that, he can also cast spells which need to be created by combining items with elements and also use items like healing potions and revives for his party. 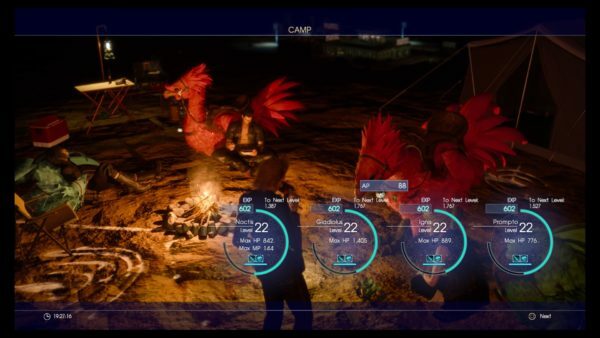 The new combat system is welcome news for gamers who get bored of the turn-based party combat and watching the same battle animations over and over again in previous FF games. However, FFXV’s fast-paced combat and the many tactics such as spells, weapons, tag-team attacks and warp-strikes take a bit of getting used to. 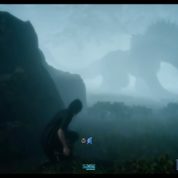 For this, I found the “wait” mode in combat extremely useful as it is easy to be overwhelmed especially since the Imperial troops from the enemy Niflheim empire have the knack for descending on your party when they are busy fighting large groups of monsters. 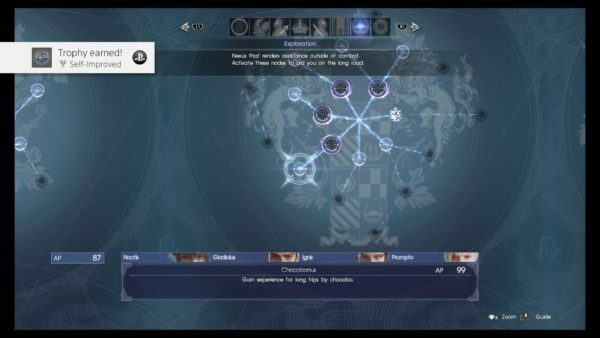 Through battles and quests, Noctis also gains Ascension Points (AP) which can be used to level up the skill trees for the entire party or for certain members, offering boosts, bonus points or special attacks. Fans of the FF series are in for a treat – you can listen to the soundtrack of past FF games for some nostalgia, if you purchase an MP3 player in-game, you can also listen to music while on foot. FFXV for the PlayStation 4 is at SGD 84.90 for the standard edition while the deluxe edition at SGD 129.90 includes the Kingsglaive animated movie which offers more context to the game. Another bit of pre-work you might need to do is to watch “Brotherhood: Final Fantasy XV”. This is an animated series composed of five episodes, which was released on the video game’s official YouTube channel here. FFXV is truly a game to be savoured slowly, like the gourmet food whipped up by Ignis. Take your time to wander and explore – as I did. 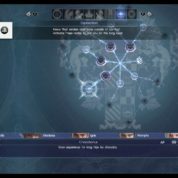 Against a backdrop of a kingdom invasion and fighting off enemies, the many side quests and fun minigames can seriously detract one from the core story mission. It’s a must for FF fans or those wanting to immerse themselves in a fantastical world. The main reason why there is no girls in the group, is it’s because it’s a story about brotherhood, friendship and loyalty. The chocobros wouldn’t have had the same dynamis with a girl in their midst. Prompto always goes crazy where there is a pretty girl a round so I don’t think they would have been as comfortable.